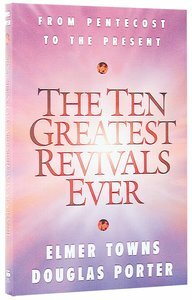 About "The Ten Greatest Revivals Ever"
"Revive Us Again! "In wave after wave, epoch after epoch, God has come to enflame the hearts of believers and to bring new life to countless men, women, and children. God-sent revivals display a glorious diversity of methods, milieus, and models.Drs. Elmer Towns and Douglas Porter collaborated to write this fast-moving series of accounts and determined their order of One through Ten after asking seventeen Christians prominent in their fields of study and outreach: "Which revival epochs are the greatest of all time?" This book will both inform your mind about the living history of Christian revivals and ignite your passion for the next wave of revival. May it come in our time! Authors Towns & Porter have studied revival areas throughout history in order to identify the ten that seem to have been the greatest of all time. An unique feature are the comments by major evangelists & pastors on the revival that has had the most significant shaping effect on their lives.